Rarest of the rare: Tempo. 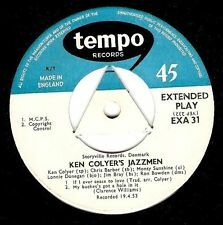 The British Tempo label founded in 1946 by Colin Pomroy and George Davies, issuing jazz on 78’s. In 1953 British Vogue acquired the Tempo catalogue and the following year 1954 Vogue was acquired by Decca under Tony Hall, who used it to issue British modern jazz recordings – LAP 10″ and TAP 12″ series- plus a large number of extended play EXA 7″ EPs, until it discarded the label in 1961, cosolidating it under Vogue. Tempo runout with “VGMT” matrix codes the same style as Vogue and Contemporary Vogue, indicating they were pressed by Decca, New Malden. A dealer once told me Decca mastered jazz records on the same lathes used for classical music, reflecting the greater sensitivity required for mastering complex orchestral works and not three-chord tricks from the Pop music Division. Possibly true, or a vinyl myth. Both examples below show deep groove dies in use, one under the outer rim of the label, the other in the more conventional central area. Deep Groove has no bearing on the sound quality other than confirming the record was pressed some time on or before 1960 when these dies were the norm, the period in which vinyl pressing was generally at its best in audio quality. Only buy Tempo Records in Dobells!? 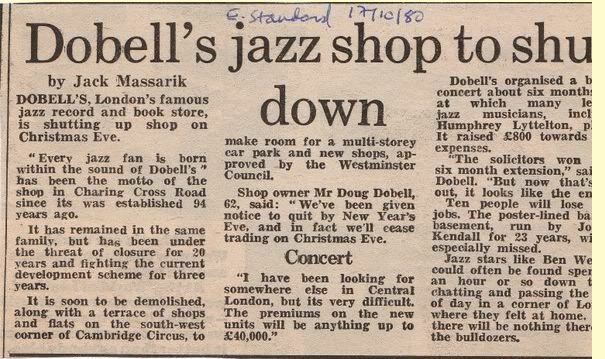 Dobells Folk and Jazz, the legendary shop at 75-77 Charing Cross Road during the Fifties and Sixties, and which closed in the early 1980’s. This may go some way to explaining the extreme rarity of Tempo records, and their eye-watering prices on eBay. UPDATE November 12, 2017 : eagle-eyed LJC reader Alex spotted this Tempo with another record shop stockist, Wells Music Stores, Romford, 14 miles northeast of the Charing Cross Road. Complete Tempo discography here: http://vzone.virgin.net/davidh.taylor/recordt.htm. Below, an example of what happens when a Tempo now hits eBay, as this did only recently, with 37 bids, an eye-watering £2,000. Tempo also released a wide range of EP s however, these are out-of-scope for me, so I have nothing really to contribute on these, other than to note that they are a lot cheaper and less collectible than the LPs. The Tempo catalogue went on to be reissued on vinyl in the early 1980’s on the UK Jasmine label. 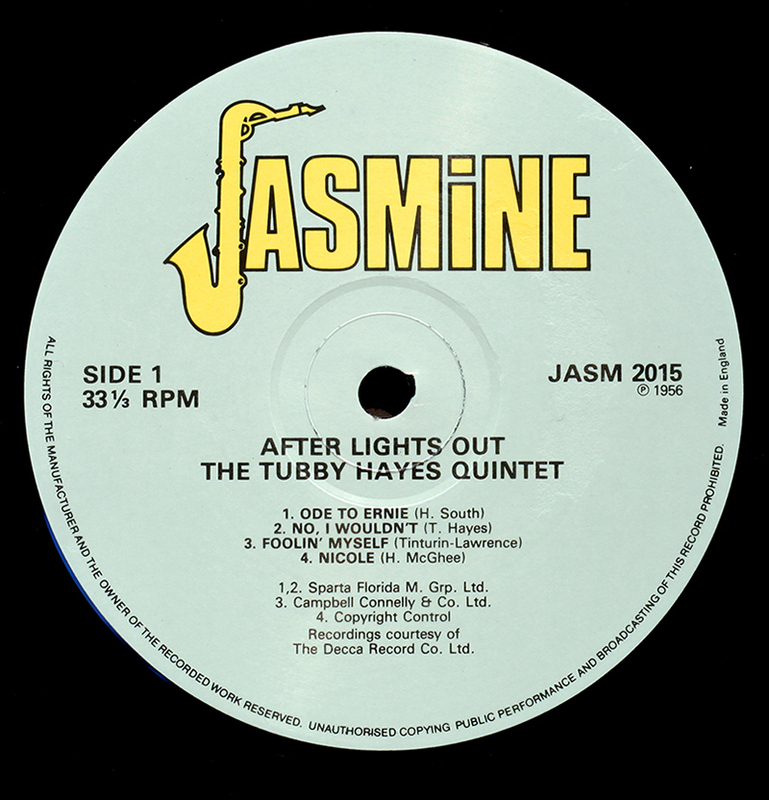 Widely overlooked as mere “reissues”, Jasmine releases are excellent audio quality despite being dubbed from the earlier LPs, though obviously no better than the quality of their source. Given original Tempos are rarer than hen’s teeth and cost thousands if and when one comes to market, the Jasmines, at about £10, are a very affordable vinyl alternative and a really good listen. Jasmine now issue CDs of all the catalogue. Something very understated and “British” about some of them. Collecting Tempo originals is not for the faint-hearted. This is the price-point that Tubby Hayes Tempo’s max out at, courtesy of Popsike. I have a copy of Big Bill Broonzy An evening with TEMPO TAP 23 .Found it in a skip with some other LPS in near mint condition.Could somebody tell me if it is worth anything.Thanks. I have a copy of a 78rpm [Tempo – Division of Vogue Records Ltd] – Catalogue No. A16 – Huddie Leadbetter (sic) Digging My Potatoes/Defense Blues which I bought as a ‘remainder’ for about two shillings, from a small record shop in Liverpool in the late 1950s. It is obviously a 1953 or later pressing as it was in ’53 that Vogue acquired Tempo. There is no sign of this pressing on Discogs. Does anyone have any idea as to its current value? (not that I am selling at this time). Terry Lightfoot and his jazz men. Been looking on line but can’t find much about it, can you please help. Hi, British Trad and Dixieland is way off my metier, I’m with the Modernists, The Tubster, Dizzy Reece, Don Rendell, perhaps another reader can help out. I held the Tommy Whittle Quintet in my hands today, as well as the After Lights out, but that did not distract me as much as I have a good reissue of that. Trying to decide what to offer on the WHittle, my old guide says £700, only two on popsike were £1100 and £2k. It was mint. Surely one of the hardest to find UK modern jazz titles? I know Dusk Fire goes for a premium, but this one just does not come on the market. You will be paying for true scarcity, only three copies appear to have come to auction in a decade. Tubby’s Tempos at least sold in many hundreds and turn up, from time to time, though pricey. I would expect its auction price to be over £2,000, if only because every potential bidder will be aware of that benchmark auction. If it is not in an auction, whatever the seller wants. Question for you is how badly you want it. Personally I don’t think any record is worth that much to me, however I am not that sort of collector, others may be. is it New Horizons? With Klein? Great record, not because of it scarcity, but intrinsically.. TAP 16 – This is a compilation album by the Dave Carey Jazzband called ‘Selections’ I have a test pressing of this LP 2 single sided Test Pressings. My father bought it about 25 years ago. Your list of Tempo EXA records omits EXA34 a copy of which is in my collection.It features Johnny Lucas and his Blueblowers .It was recorded in Hollywood in February 1954.. Tracks are: Hindustan,,Lazy River, Loveless Love and High Society. vg condition – value ? Thanks for the additional information – added to the list. 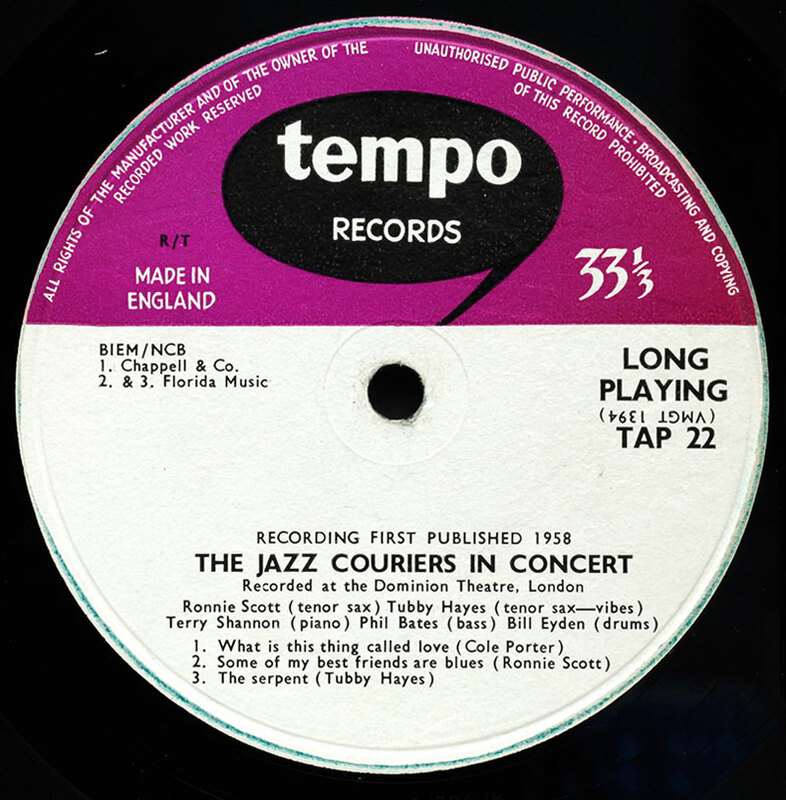 Tempo EXA EPs are valued only for the sought-after names – Tubby Hayes and Don Rendell. These can fetch up to £200. Other titles by less collectable artists, I hesitate to guess, but probably not worth very much. Tempo TAP 31 was by The Swedish Jazz Quartet. Not many people know that. Even fewer have heard it. Simon: it is The Swedish Modern Jazz Group, the Nils Lindberg septette incl. Lars Gullin, ex Barben Records. Beautiful music. I have this one on Swedish Telestar TRS 11121.under the very original title “Sax Appeal”. .
A shame, I came across this splendid Tempo review only now. I once had a Tempo album by Trad clarinettist George Lewis (TAP 13). This may have been the only example of Tempo issuing US material for the U.K. market. The material is from the Jazz Man label, a session recorded in 1953. No, there was also the firehouse five ep, a US trad revival outfit. Incidentally, I had a copy of the Couriers TEMPO TAP 22 in my ebay watch list, and it went for £27.99 on the 1st of Nov, two bids. Missed it by small child distraction, should have been sniping, although who knows what the bidder put in as his limit. I doubt he was anything less than chuffed with that though. I have a copy of “Tubby’s Groove ” Tempo Tap 29. I bought a collection of jazz and big band records at a private house of a guy who lived nearby to my office in Oldham. Completely insane: £867 for Fontana Live at Scotts. If you drill down into the bids in the closing seconds, you see a classic example of what I call a “mid-air collision”: two bidders placing an “oversize” snipe to be sure of winning, unaware of each others position. Looks like one placed £850, the other probably £1,000 and neither expecting anything other than a sensible price-setter, maybe £200. 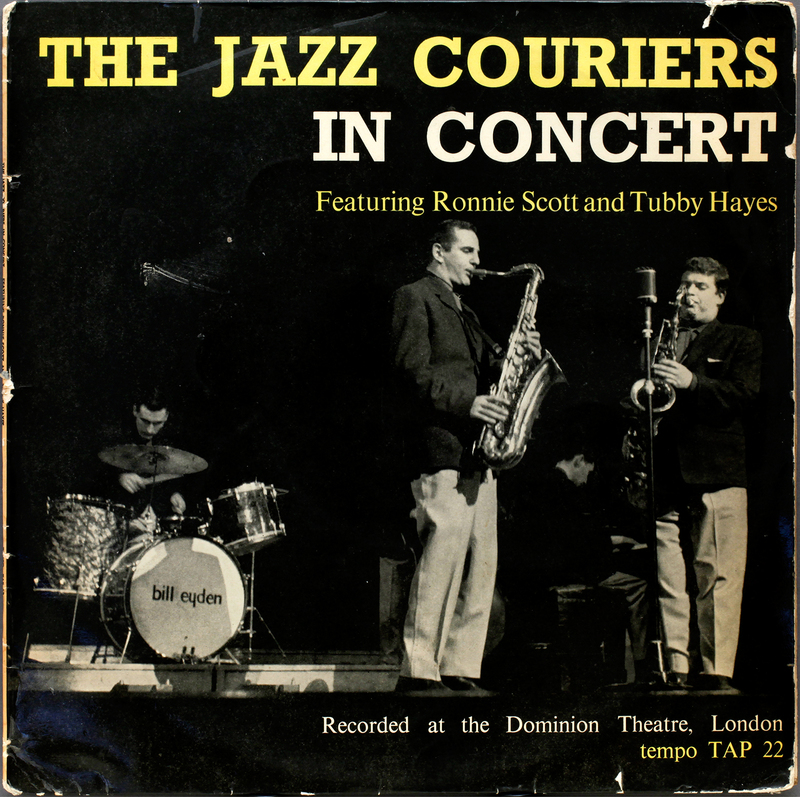 The seller hype is incendiary, and it is no coincidence that the London Jazz Festival is featuring launch of a DVD on Tubby, fronted by tenorist extraordinaire Simon Spillet. Tubbymania?